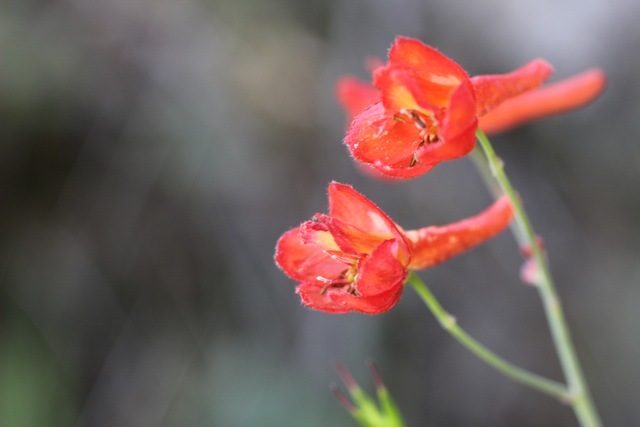 The brilliant red of canyon larkspur seems to glow in the shade of a rocky hillside. Also known as red larkspur, the color of Delphinium nudicaule flowers is so intense that it nearly vibrates. Each little flower tapers to a point in the back; an artists’ rendering of a gnome’s cap or the cowl of Little Red Riding Hood’s cape. Red larkspur tends to grow most prolifically on shaded, rocky slopes. 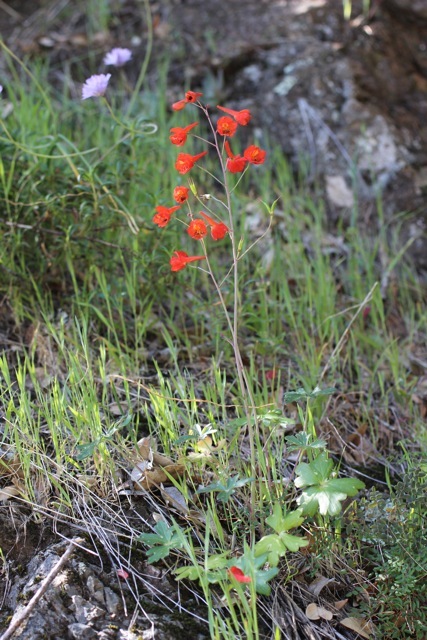 It is found across much of Northern California, and is not to be confused with scarlet larkspur–which grows farther south and has plants with more densely clustered flowers. It’s the only red larkspur in the area (though there is one yellow-flowered species, and several that are blue, white, or purple). According to the Marin Flora, this species has been found to hybridise with the blue-flowered coastal larkspur, creating offspring that are coral, lavender or purple. All parts of the plant are highly poisonous–don’t eat it!